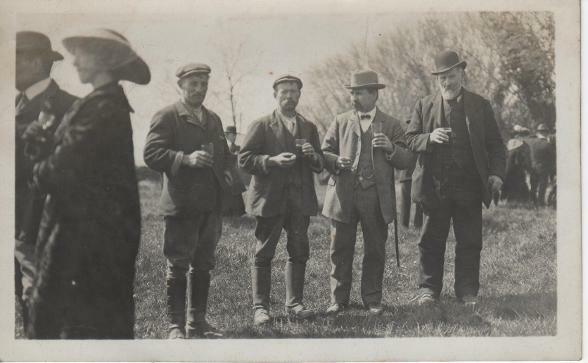 suggests that the photographer had connections with Chudleigh at one time. 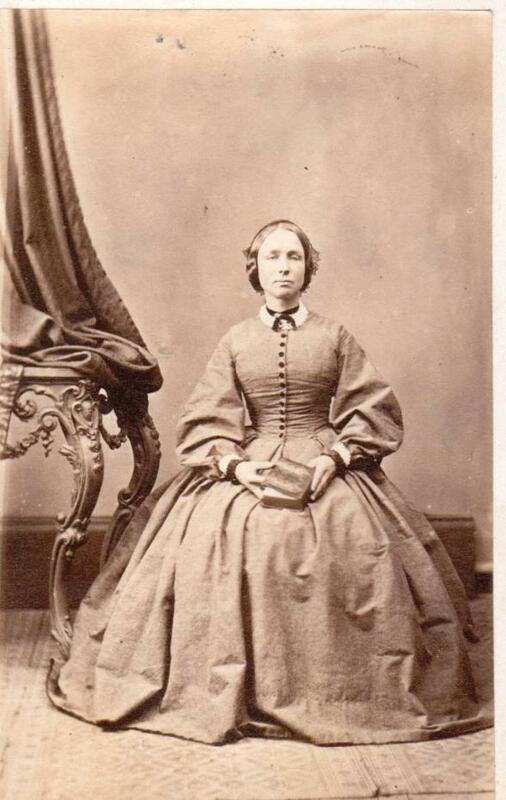 Above and top: These images, showing ladies in full crinoline dresses, are probably from around the 1860s. 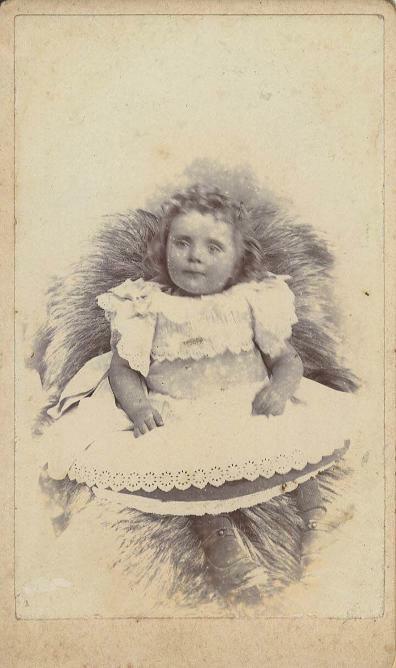 Of a small size, just under 6½ cm x 10½ cm (2½" x 4 "), these photographs were known as cartes de visite. See the Virtual museum 1860s section for more on cartes de visite, and the craze for collecting them, known as cartomania. 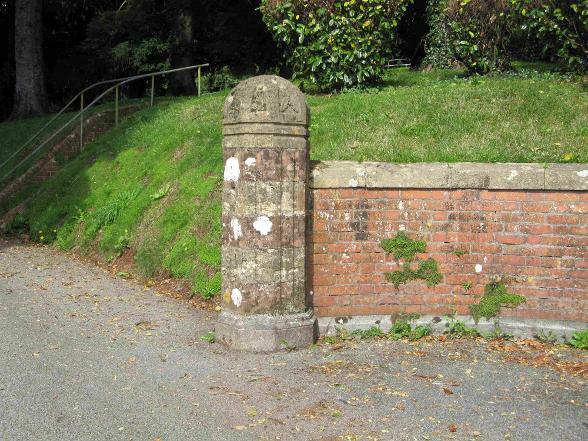 Joseph Henry Blampey (Blampy in Familysearch) was baptised 5th December 1830 in Dittisham, Devon. 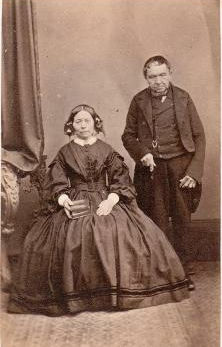 He married Mary Ann Towell in the Newton Abbot registration district in the first quarter of 1856, and by 1861 the couple were living in St Marychurch with two young children. Mary Ann describes herself as a grocer, and Joseph is a photographic artist. 1881 Mary A Blampey and six children aged from 10 to 26 were living in Fore Street, St Mary Church. Mary A describes herself as photographer's wife, and 16 year old William H is a photographer's assistant. At the time of the census Joseph appears to have been a visitor in St Pancras, London. Above and right: Front and reverse of photograph by J Blampey, East St., Ashburton. The subjects of the photograph are unknown. 1884, St Marychurch. 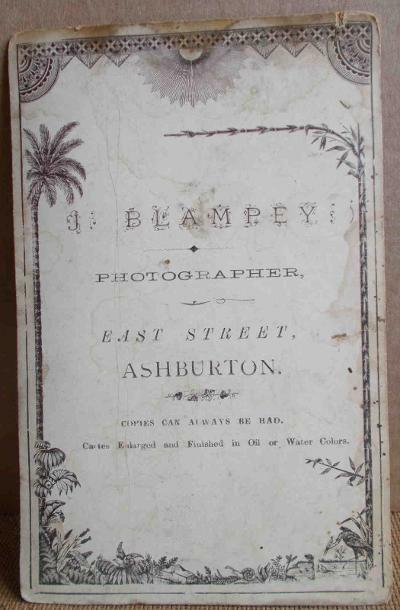 Joseph Blampey, photographer, was summonsed for attacking Thomas Memery, an auctioneer and house agent. 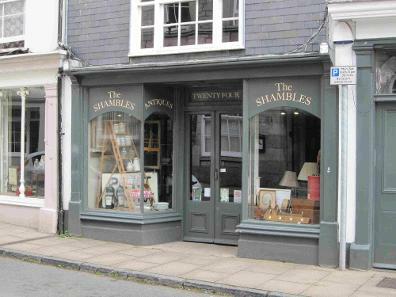 Some of Mr Blampey's goods had been seized and sold in payment of a debt, but when he attempted to enter Joseph's house after this event a scuffle ensued. A stick and an umbrella were involved in the fight, but it was unclear who had attacked first, and the Chairman of the Bench said that 'a fearful amount of perjury' had occurred. The case was dismissed. The 1891 census shows Joseph Blampey, aged 60 and living with his wife Mary A in East Street. Both were born in Torquay. 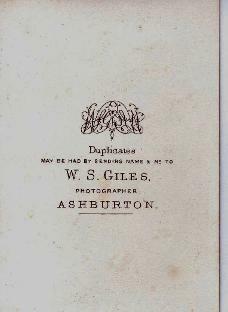 According to the website PhotoLondon Joseph exhibited at the Society of Miniaturists 1902-03. 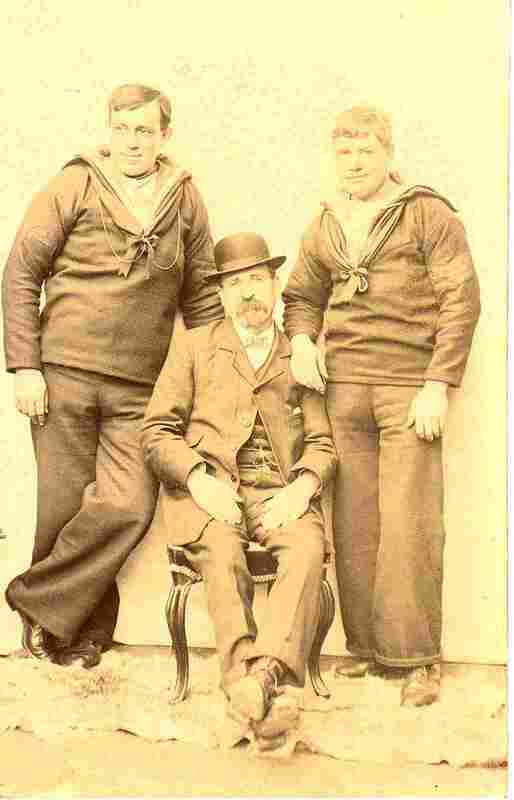 J H Bampey died suddenly in May 1913, at his house in West Street; he was 82. He had had a photographic business 'for many years' in East Street. Left: Photograph of an unidentified child by J Blampey, East St.
Born in 1887, Wilfred was the son of Daniel Ogilvie and Annie M Evans. By 1911 he was living in West Street at no. 7 and working in the family business of druggist and dentist: they also sold wines and spirits. In addition, Wilfred dealt in photography. Left and above: Although the location is not named on the card, it seems almost certainly to have been taken outside Kenwyn. See my own photograph below (taken 2015) - the gates are no longer there, but the brickwork, mouldings and decoration look identical. 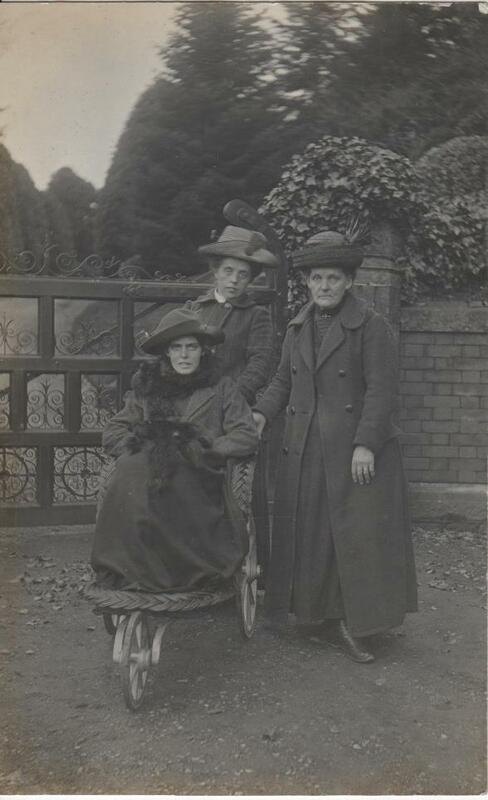 The ladies are: Emily Coleman on right with Bessie Townsend in chair and her mother behind (Many thanks to Pete Webb for this information, which originally came from a relative of one of the women). Above, right and below: These photographs are all by Wilfred J O Evans. Most of the people and places are unidentified, (but see below) but all came from an album collected by the Butler family, who were originally at the Sun Inn, North St.
During the First World War Wilfred's appeal against serving in the forces was supported by a representative of the Commissioners of the National Health Insurance. The case he put forward in 1916 was that his father, aged 75, needed assistance in the pharmacy. The Chairman of the tribunal stated, 'We cannot leave this young man at home.' On being told that Wilfred's father could not find anyone else to help him, the Chairman replied,'Then people must go short of medicines.' (laughter). Wilfred joined the Royal Garrison Artillery and died aged 29 on 19th July 1917. When Daniel Evans, Wilfred's father, died in 1919, the newspaper report said that he had been a chemist and pharmacist in West Street for nearly 30 years. He had been in failing health ever since the death of his son two years previously. 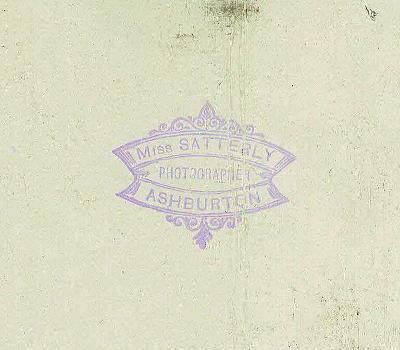 Left: 'Miss Satterly, photgrapher, Ashburton' on the back of an unidentified wedding photograph (see Some Banns and Marriages, under People and Properties). 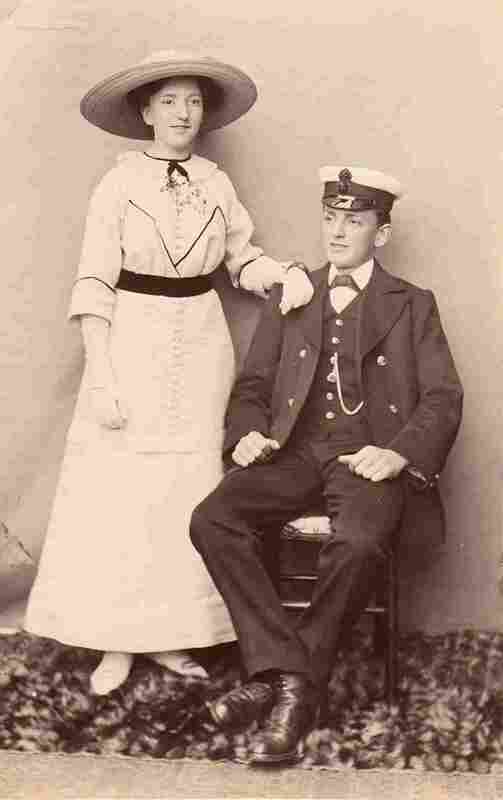 Assuming that she used her married name after 1909, this would date the photograph to before that date. Another child was born to the couple later in 1911. William T Hannaford died the following year, and a third child was born after his death, leaving Amy with three very young children. 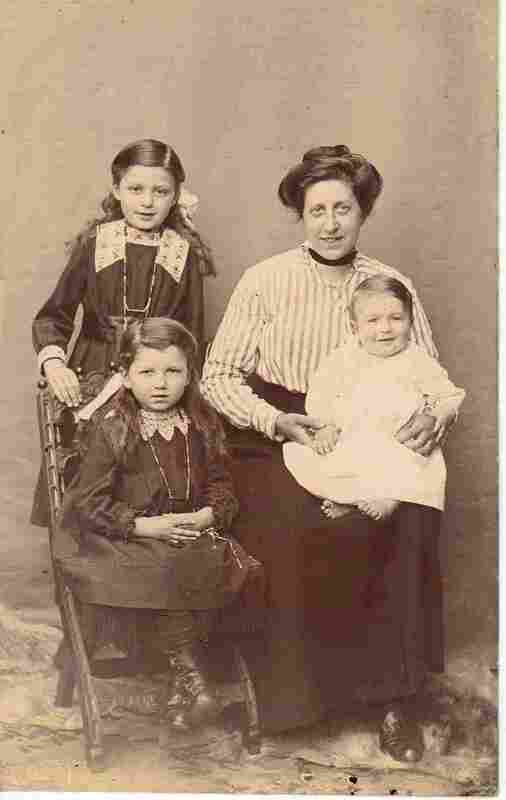 At some stage she moved back to Ashburton, and as her youngest child, William T, was registered in the Newton Abbot district it is likely that she was there by the end of 1912. She moved to 3 Vealenia Terrace, an address that features on some of her work - occasionally it looks like an '8', but this number does not exist. Oddly, the four houses in Vealenia Terrace are numbered 3 - 6 (left to right in the photograph below). Above: Vealenia Terrace. The skirts and blouses of the women suggest an Edwardian date. No photographer is named on this photograph. 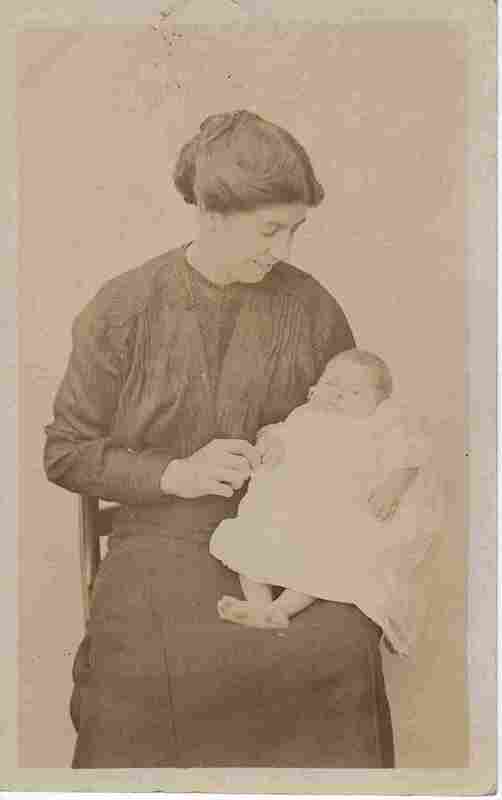 Below: An unidentified woman and child, photographer Mrs A Hannaford. Amy married for a second time - an Amy Hannaford married Frederick H White in the June quarter of 1923 in the Newton Abbot registration district. 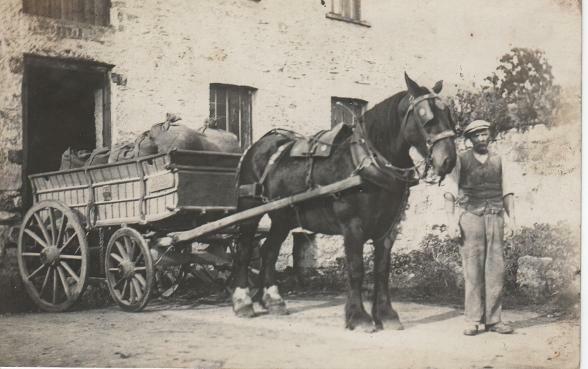 When Frederick, a retired postman, died at his home Mapleton, West Street, in 1937, he was 73 years old. Amongst the mourners at his funeral was his brother-in-law Mr E J Satterly. Amy probably died aged 83 in the June quarter of 1965. Right and below: Photographs by Mrs. A Hannaford. The subjects are all unidentified, but were part of an album collected by the Misses Butler. James S Ruth and his wife Annie, both born in Aveton Gifford, Devon, are in Pontypridd, Wales, at the time of the 1911 census. James is a photographer on his own account. Two children are with them, one of whom is 6 year old Leonard, who was born in Plymouth. James Seward Ruth had married Mary Ann Edgecombe in 1904; Arthur Leonard Ruth's birth was registered in Plymouth in the December quarter of that year. 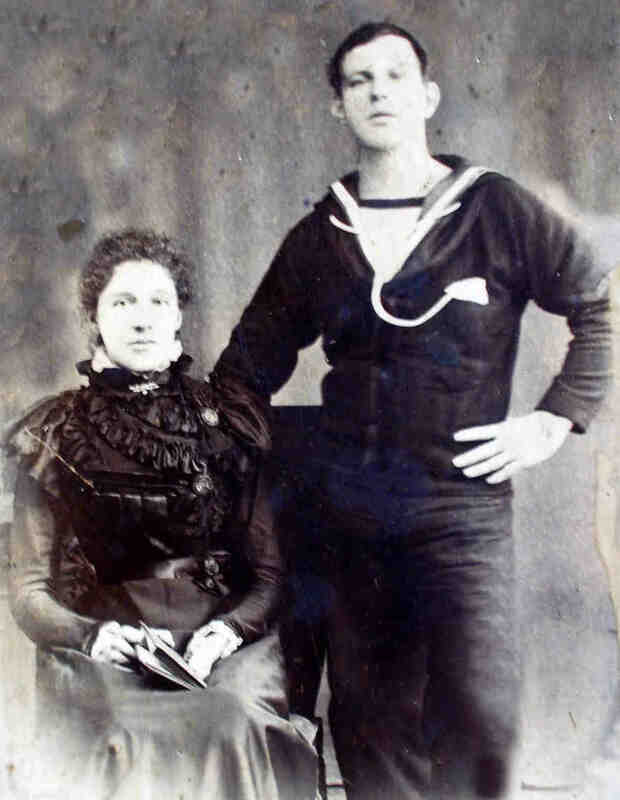 He was baptised at the Wesleyan Methodist Chapel in King St, Plymouth, in November 1904, with his parents are named as James Seward Ruth and Mary Ann. 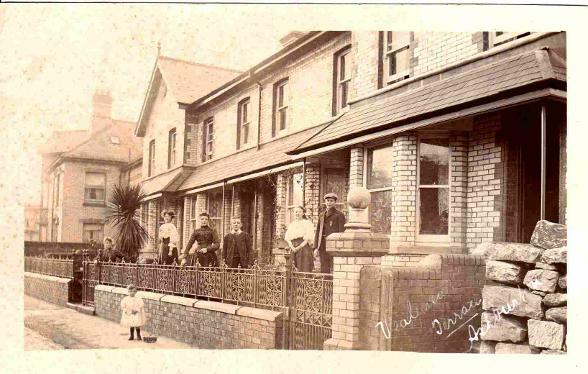 They were living at 28, Clarence St.
Circa the 1920s 'Ruth & Sons', Aveton Gifford, were publishing postcards. Item sold privately, not in my possession. By 1935 Jas. 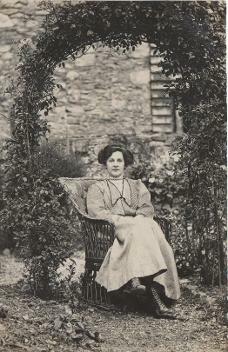 S. Ruth is shown in Kelly's Directory of Devon as a rating officer and photographer in Aveton Gifford, at The Hill. At some stage the Ruths' son Arthur Leonard, together with his brother Kenneth Edgecombe, came to Ashburton. In the 1939 Register Arthur L Ruth and his wife Edith* are living at 24, North Street. Born in 1904, he is a photographer and fancy goods dealer. Arthur Leonard Ruth was in trouble in 1940 with the new blackout regulations. He was fined 5s for allowing light to show at the rear of his house, 24 North Street. Ruth postcards exist from a wide area of the county, but there seem to be relatively few of Ashburton. 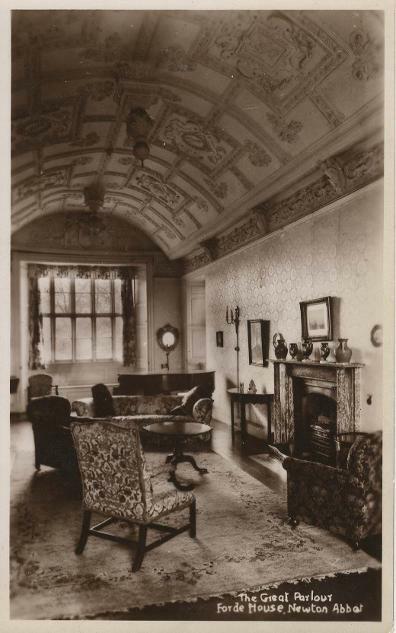 On the right is a photograph of the Great Parlour at Forde House, Newton Abbot - this was taken by A L Ruth. 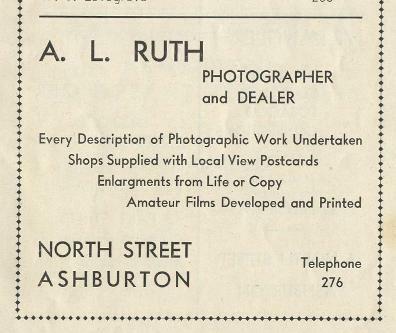 Above: Advertisement for Kenneth E Ruth from the Official Guide of Ashburton, 1950s. In 1935 the engagement was announced between Betty May Whitcher* and Kenneth Edgecombe Ruth. 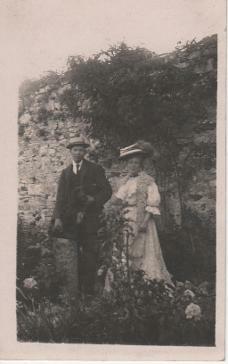 Kenneth was the youngest son of Mr and Mrs J S Ruth of Aveton Gifford, South Devon. *Betty May Ruth died in 1940 of tuberculosis. She was 22. Kenneth' second wife, Eileen, also died young. She was 33 when she died of a pulmonary embolism in 1947. He appears to have married Gladys E Huxtable (also indexed as Vincent) in 1951, in the Tavistock registration district. Kenneth may be the same Kenneth E Ruth who is living at The Chalet, Dartmeet, in the electoral registers of 1950. 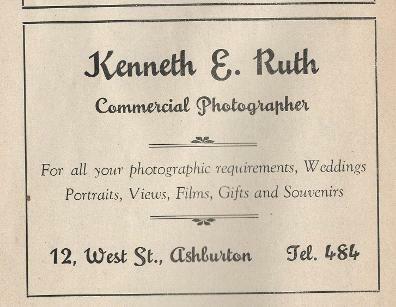 In 1953 Kenneth E Ruth, Commercial Photographer, is living at 12 West St., Ashburton. Dartmoor. This is possibly The Chalet in the electoral register above.